At 4-4, facing the prospect of being 4-5 and making the trip to Seattle to face the extremely tough Seahawks, the Philadelphia Eagles absolutely had to take care of business at home and beat the Atlanta Falcons on Sunday. And that's exactly what they did. As always, win or lose, we hand out 10 awards. The 2015 Pittsburgh Steelers were as explosive as any team in the NFL, gaining 6.3 yards per play, best in the league. In 2016, heading into their game Sunday with the Eagles, there's probably little debate that the Atlanta Falcons were (and still are) the best offense in the NFL, gaining 6.8 yards per play, which again, is best in the league. The Eagles faced both teams so far this season, and held them to a combined 18 points. The Eagles' defense is legit. They've had some hiccups along the way, most notably against the Redskins, but when they're playing like they are capable of playing, they can hang with any team in the league. During the Eagles-Vikings game, Ryan Mathews committed the cardinal sin for running backs. He fumbled with a lead in the fourth quarter. It was the second time he had done so this season, after fumbling the game away on the road in Detroit. After the Vikings game, we proposed that Mathews be launched into the sun. On Sunday against the Falcons, Mathews ran the ball 19 times for 109 yards and two scores and looked good in the process. So, you know, sorry for firing you into the sun, Ryan. Julio Jones had 10 receptions for 135 yards, which feels like a big day, but really wasn't, considering the circumstances. The Eagles were down their best corner, Nolan Carroll, while their other starter, Leodis McKelvin, looked far from 100 percent. I'm sure Eagles fans will take 10 receptions for 135 yards and no scores from Julio every single time. But Julio himself had a huge gaffe in this game when he got open on third and long late in the fourth quarter, and dropped an extremely easy catch. Matt Bryant meanwhile, of "devastating 62-yard field goal against the Eagles in 2006" fame, has been an Eagle killer for years. Today he missed a field goal as well as a PAT. And finally, head coach Dan Quinn called two of the most asinine timeouts I've ever seen. If Quinn coached the Eagles, the fan base and media would be merciless this week. This was the most impressive performance of the season by the Eagles' offensive line. They paved the way for Eagles backs to run for 208 yards on 38 carries, and gave Carson Wentz plenty of time to throw. And they did it without two starters. I don't know what everyone is bitching about. I thought the officials did fine job of officiating, personally. Maybe Jordan Matthews' face just shouldn't have been where Falcons safety Keanu Neal was launching himself with the crown of his helmet. Did anyone consider that? Also, he made the game-sealing interception, so there's that too. You just can't throw at Leodis McKelvin for the 22nd time and expect to get away with it. This was Carson Wentz's first fourth-quarter comeback. With the Falcons holding a 15-13 lead, Wentz orchestrated an eight-play, 76-yard drive that ended with a five-yard touchdown run by Mathews. 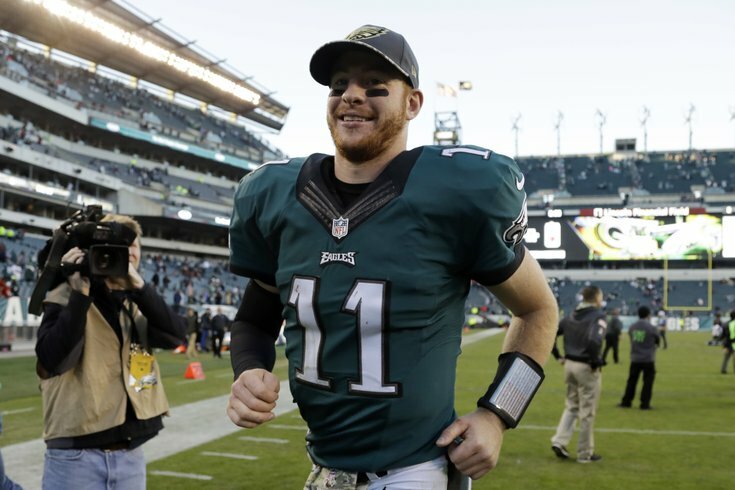 On the drive, Wentz was 5 of 6 for 42 yards, plus a 21-yard penalty for pass interference. OK, so that's not exactly Joe Montana pointing out John Candy sitting in the stands and then leading a game-winning drive in the Super Bowl, but it was his first close win as a pro. Golf claps all around. 5 targets, 2 catches, 7 yards, 1 enormous drop. The Vikings lost to the Redskins Sunday and look very much like a trainwreck after having lost their last four games. Back when the Vikings were 5-0, it appeared as though their first-round pick (which the Eagles now own for the low cost of one Sam Bradford) was going to be very late in the draft order. If the Vikings continue to lose and the either the Packers or Lions can do just enough to win the NFC North, the Eagles might have themselves a pretty good pick in the first round. So thanks, Sleevie. Doug Pederson, if the Eagles lose and you make ONE play call that people don't like, your name will be dragged through the mud endlessly until the Eagles win again. And maybe for a little longer after that. For one week anyway, mayyyybe radio callers can contain themselves from screaming, "WHY'D HE RUN IT OUTSIDE ON THIRD AND GOAL?!? FIRE HIM!"